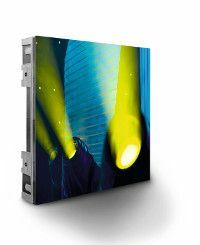 eyevis has created high-resolution LED modules that are designed for use in digital signage applications, control and conference rooms at trade fairs and events, or in TV studios. eyevis’s LED modules can also be used in digital signage environments like permanent indoor installations and mobile video walls. The modules allow for the assembly of bezel-free video walls. The small pixel pitch of between 1.5 to 2.5 mm and screen brightness of 1.500 cd/m² help to provide a clear image in bright ambient light conditions or with small viewing distances. Additionally, LEDs offer a wider viewing angle horizontally as well as vertically. Regarding digital signage and other displays, the LED modules are equipped with specific attributes that can adapt to different environments. The high-quality LED modules are 100% EMV compatible, allowing for permanent installations as a commercial display or large-scale information wall in showrooms, train stations, airports or sports arenas. The LEDs can also be utilized as video walls in TV studios because of their adjustable color temperature. With the higher flexibility of a modular system, the LEDs can even be used in mobile video walls for the events and presentation sector. The modules can be arranged hanging or standing, as well as in concave shapes providing further creative digital signage opportunities. eyevis equipped its LED modules with the same image processing system that is installed in the well-tried omniSHAPES. Design, planning, assembly and source transmission of creative LED walls in this way are quick and flexible. The modules are equipped with front and rear access, which allows for maintenance or exchange of all electronic components without having to disassemble the module or even the entire wall.